Rewrote history of Dust and Aura training and expertise for better clarity and organization. Recent history changed to explain how she came to work at Beacon and detailed her position there. Added redundancy regarding capabilities with Dust, in reference to what she does at Beacon Academy. Rewritten to accomodate changes in weapon and general design of character. Utility Form section added which details how her staff is also used as gardening implements, a chainsaw, and an umbrella. Shows specific categories of attacks. Explains how she activates the attacks. Gives examples of various attacks. Weapon History is more descriptive. Grammatical and Spelling errors corrected throughout the document. 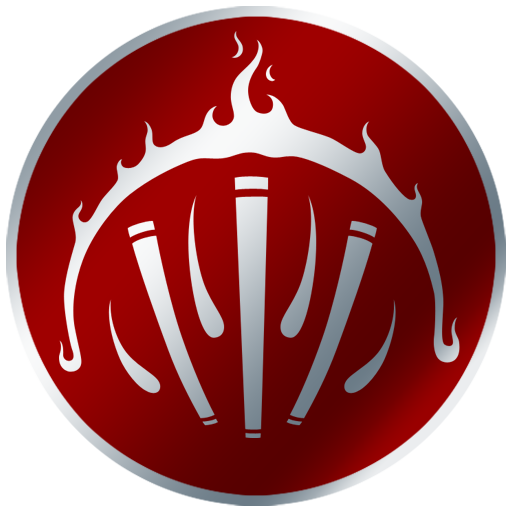 Symbol: Flameward. Her symbol was designed and named based on her favoritism toward fire in her early days of combat school. Occupation: Groundskeeper at Beacon Academy. Appearance: Kirkka stands at an even six feet(183 cm) and weighs in around 161(73kgs)pounds. She looks like she keeps herself fit, but is hardly a bodybuilder. A very faint tan is sometimes present on her face and arms due to being outside often for her job, but otherwise, there are no visible markings on her. She has well-kempt auburn and black streaked hair, nearly always tied into a ponytail that reaches just past her shoulder blades. Her oval shaped face sports grey eyes sitting above her average sized nose, glancing about as she observes her surroundings closely but discretely with an innocent smile. She looks to be about her age, perhaps a few years older. A cloth piece is wrapped around her chest to allow maximum flexibility while also supporting her. Its edges have small lacy flair. Over that, dual layer shoulder pads attached to a hood cover her shoulders, extending beyond them just slightly. She often keeps the hood down, especially when not on missions. Unless it’s raining. Fingerless gloves extend all the way up her arms, reaching her biceps before ending with more decorative flair. Wind-like metalwork covers the back of her hand and her forearms. She can sometimes be seen wearing small caps on her fingers, similar to thimbles. These protect fingers from dust-related accidents while working with it. Her lower half is covered by a mid-thigh length skirt, and over that, a waist cape that reaches just to her ankles. The cape is made of cloth, but layers of a leather cover the two sides. The uncovered backside is decorated with a few straps and buckles, but they seem to be decorative only. On the sides of the skirt where it meets with the cape, six large square rivets hold the two pieces together as one. Sturdy boots are covered by cloth leggings that end just before the skirt starts. The entire outfit is primarily dark red with a light matte grey. Album. Kirkka’s primary weapon, Ira, rests securely strapped horizontally to her lower back in its three segments. The power of MAGNETS allows her to draw them individually or at once. Each segment connects to the next as they are drawn. Just below this holster, attached to her belt, is a small series of pouches, which contain extra Dust canisters for her weapon, and other minor trinkets. Her symbol is seen on a pouch on her left side. Everything about her attire is designed with mobility in mind, and Kirkka is able to move very freely. History: Kirkka Scarlet is the daughter of Claire and Reginald Scarlet, born on the 6th of Niege, 42 AC. The family lived in a small village on the outskirts of the Kingdom of Vale, but that only lasted until Kirkka was two, when they were forced to evacuate due to repeated Grimm attacks. The village suffered heavy casualties in an attack only a day before when a passing Huntsmen warned the village of another impending attack that was even larger than the last. The village evacuated together and managed to return to Vale, suffering only minor casualties on the trip back. Kirkka’s family all made it back to Vale where they moved in with Claire’s friends until they could get their own home. Kirkka’s father was a huntsman who retired once she was born. As such, Kirkka had plenty of time to learn about his world and became very interested in Dust specifically. She spent much of her time learning all she could about the material and followed in her father’s footsteps by enrolling at Signal Academy when the time came. While her time at Signal was spent learning both general knowledge, and how to fight, her time at home was spent further studying Dust, and its uses throughout the world. Ira, her staff, has been with her since she built the first iteration of it at Signal. As expected by everyone, it was designed in order to maximize the use and utility of Dust. Her abilities and focus led to her often playing a support role in battles, using Dust to enhance her allies, debilitate her enemies and control the battlefield. In her final year at Signal, her parents got divorced. Her father moved away when he learned of Claire’s affair with a neighbor of theirs. Kirkka did not speak with her mother for a long time after hearing the news. Upon graduating from Signal, Kirkka made plans to study Dust at a specialized school. Her father, who was living in Atlas at the time, convinced her to attend Beacon instead, citing that she can learn so much more there. She agreed and was later accepted to the prestigious Academy. It wasn’t until Kirkka’s third year at Beacon that her mother had married another man. She learned this man was their neighbor for years, and they had been having an affair. This only drove Kirkka and her mother further apart. A few short months later, Kirkka's mother Claire gave birth to Kaali Charen, Kirkka’s half-sister. Unfortunately, there were complications during birth, and Claire did not survive the ordeal. Kirkka despised herself for not reconciling with her mother. Graduating top of her class in Dust mechanics and in the top five for Aura mechanics, Kirkka parted with her team and went on to a trade school specializing in Dust, Dust based weaponry and tools, such as Semblance Catalysts. She spent a few terms there before taking an internship and eventually a job at a facility that researches the creation and evolution of Dust based weaponry. At the age of 24, Kirkka became the legal guardian of her half-sister Kaali Charen. Kaali was four years old by now, and Kirkka struggled to raise her despite her aversion to children. One year afterward, Kirkka met an unusual person. She called herself Rose, and she claimed to be from the future. Kirkka’s unique semblance granted her the ability to have proof of that, but even then she remained skeptical. When they went together to meet with the Headmaster of Beacon, he was much more quickly convinced of the fact. The Headmaster insisted that Kirkka accepts a job at Beacon Academy based on this recent revelation, and explained that her abilities, especially her semblance, will be extremely useful in the coming years. She agreed, and it has been twelve years since then. Kirkka assists with running a small shop that sells specialized Dust and Semblance Catalyst Foci to students, but her actual position is Groundskeeper of the Academy. Personality: As someone who interacts with others often, Kirkka is typically quite friendly when approached, but she rarely starts conversations with others, preferring to remain with her own thoughts. When engaged, she prefers to discuss her hobbies or expertise: Dust, weapons, Aura and semblances. Kirkka has had quite some time to get over it, but she still recalls the pain of her mother's death. They were on very bad terms when it happened, and Kirkka struggles to forgive herself for allowing the situation to evolve into what it was. She becomes awkwardly quiet when the topic of family comes into the conversation, with the exception of discussing her half-sister, Kaali. At Beacon, she mostly stays out of people’s way unless it’s to complain about their reckless disregard for the school grounds. She also has an irrational hatred of those who damage benches. Some say it's because of a past relationship she had with a mysterious person named Bench. She denies everything about it. Aura and Semblance: Kirkka is a master in the use of both Aura and Dust. Manipulating her own power comes second nature to her, and as such she is able to perform a wide variety of functions, from detecting nearby Aura sources or approaching Grimm, strengthening her melee strikes, and sending out short range blasts of pure force, capable to knocking back and damaging targets. Kirkka’s semblance is Psychometry, which allows her to read the history of any non-living object she is touching. Typically, she concentrates when she does this, allowing her to quickly read a great deal of the object’s history over a short period. However, if she knows the time and date a specific memory happened, a graze of her hand is all that’s needed to extract that particular memory. Kirkka has received very advanced training in the use and mechanics of Dust. She is an expert at manipulating dust to create desired effects. She is also skilled both at mixing and creating various types of dust, along with constructing Semblance Catalyst Foci. In addition to the Dust she carries, Kirkka usually carries supplies with her to produce a limited amount of Semblance Catalysts and can recharge other’s Foci in the field. Combat Behavior: Kirkka has two distinct styles of combat. One focuses on combat with allies, which she prefers. When allies are present, she maintains a support position with line of sight to the battlefield. Focusing on battlefield control, her allies are given temporary enhancements through the use of Dust, such as speed or strength boosts. As for direct control, walls of ice or flame, firestorms, lightning storms, and the like are just a few examples of what she is capable of. Such attacks can be a double-edged sword, however. While she can control the amount of dust that is released when she unleashes and attack, she cannot always control who is going to be caught in the area of effect. As such, combat in a limited space, like indoors, makes it difficult to assist allies or hinder foes. If directly engaged, Kirkka will focus on distancing herself from her assailant and deflecting attacks until she can retreat to her allies’ side. If she is alone, she chains wide area attacks to attempt to suppress her foes or kill them outright. Fighting her in small areas, or getting into her face and staying there is the best way to deal with her incredibly powerful spellcasting. Though, her staff is not to be ignored. When forced into a situation like this, she tends to focus heavily on trip attacks or other distractions in order to distance herself. If she cannot gain that precious distance, she will likely lose a fight. She is quite resourceful, though, so keeping her within reach of a claw or blade may prove difficult. Primary Form: Ira is a six foot long staff made up of three equal length segments. The end of each section is enlarged, using a magnetic locking system to keep the segments together easily. Around these systems is a complicated storage system, capable of storing six different cartridges of Dust on each end of the staff, totaling 36. When the segments are joined together, the ports to release Dust are blocked. As such, only the two ends of her staff can be fired at once, but due to the design of the weapon combined with Kirkka’s practice and use of Aura, the order of the segments can be very rapidly changed. Kirkka has been known to use the segments separately as well, one in each hand. Storage Form: Kirkka wears a holster most of the time that straps securely to her back. Each segment compresses by half a foot when being stored at an angle in the holster. When drawing the weapon, pulling on a segment from the left will pull only one segment, but when removing them from the right they will chain together and form the whole staff, fully extending to max length at the same time. This allows her to draw one long staff or two short staves as the situation requires. Dust Functions: Ira has many, many functions, and Kirkka is capable of changing out which Dusts she places within the staff, along with being able to mix her other types of Dust. This gives her an extremely wide range of functions. Some, but not all possibilities are listed below. Energy Missiles: Kirkka employs these often. They tend to fly in a straight line toward their target, and can take various forms, such as fireballs, ice shards, energy blasts, explosive blasts. They have long range and vary in speed, but are generally fast. Energy Cones: A stream of energy erupts from one end of Ira, causing high damage in a wide area and at close range. Difficult to use when fighting alongside others due to the wide area of effect. Energy Walls: Creation of a wall of energy. Firewalls and Ice walls are the most common, these barriers allow powerful control of a battlefield. Walls and barriers vary in length and height, are their size directly affects their strength. Massive ice walls will be thin compared to very small ice walls. A huge fire wall might have dispersed flames and be less damaging to anyone passing through. Storms: This is Kirkka’s offensive specialty. Raining down fire, or ice shards upon a massive area, or creating a freezing windstorm or even a sandstorm are only some of the things she can do. These are devastatingly powerful attacks, but incredibly dangerous if allies or Kirkka herself is caught within. The storms consume a localized area, but can easier cover all enemies in a small skirmish. Enhancements: Dust can be manipulated to interact with another’s Aura, granting powerful but short duration enhancements such as increased speed, strength, agility, and/or durability. Kirkka can also grant elemental barriers to others. These barriers are highly effective but dangerous when the target doesn’t know how to control it. A fire barrier would ‘ignite’ the Aura surrounding a target, causing them to burn nearby targets while themselves being protected from fire attacks. If the wearer of the barrier doesn’t have very good control of their aura, this technique can go out of control, or even harm the person. In the right hands, this effect is devastatingly powerful, but very dangerous to inexperienced people. As such, Kirkka only rarely uses on others, typically only if she knows they can handle it. "Healing": Kirkka is skilled at controlled use of Dust, and can cauterize wounds with fire. Not the best healing ever, but excellent in emergencies. History: Ira was constructed by Kirkka at Signal Academy. Originally it could only contain and use 12 types of Dust, but it has been since upgraded to the current amount of up to 36 types. Finally, she managed to recall some useful information. It was some kind of semblance that can modify her appearance, obviously. It was familiar enough to her that she remembered enough. Disregarding that for a moment, she refocused herself and went back to customer service mode, smiling and bowing slightly as she thanked Fake Mia. "Well, thank you for stopping by! Please come again!" She waved at Anna who was standing patiently in line, hoping the copycat will get the hint and get out of the way. Mia instinctively nodded and smiled to Fake Mia's gratitude, then silently watched the imposter collect some dust as she returned to the checkout counter. When Fake Mia came up to the counter, Mia raised an eyebrow in anticipation of the following conversation. She took a mental note of Anna following up and waiting in line before directing her attention to her double. "I apologize, but it's much too early for these shenanigans. But yes, you've probably seen me before. My name is Mia Brightspear and I run this shop." She quickly rung Fake Mia's dust cannister up and gave the total cost, wanting to be done with this conversation. But then she had a thought. Her register IDs people when they purchase goods from her store, to ensure they are a student or faculty member. Which means it should be easy to figure out who Fake Mia is as soon as she swipes her Scroll. She lightly motioned toward the scanner, expecting Fake Mia to pass her Scroll over it. There was this one time where Mia made the world's largest waffle. And then Waffle ate it. At least, in his dreams he did. And she did. It is a recurring dream for Waffle, and if he were capable of lucid dreaming, it would likely be the only thing he ever dreamt of. Waffle gave a bear sigh and then checked his surroundings, deciding the best course of action was to not attempt to enter through the front door. He took up his post just to the left of the door, sitting down and then scratching his neck for a few moments out of boredom. Mia had heard about Anastasia's semblance from her friend Kirkka, but truth be told, she was only barely paying attention at the time. Kirkka had been rambling on about many, many things and Mia had lost interest long ago. She was probably going over her grocery list in her mind when Kirkka mentioned the capabilities of this unique semblance. All that said, she remembers something about the conversation... just not the details. The shopkeeper struggled with it but managed to keep her composure. For the moment. "Er, well, the dispensers are all labeled clearly at the bottom." She pointed to the wall of dispensers, being too far to accurately point out the labels themselves. They were quite visible if perhaps a little difficult to read from across the shop. "As for using them... you just attach the dust containers to the nozzle and press the button. The dispenser will fill the container until you release it or until it's... full." She squinted her eyes slightly as she struggled to recall that important piece of information she ignored a while back. Just who is this person and why does she look like me? She doesn't sound like me at all, though. Hmmm... Mia racked her brain some more while she maintained a strong focus on the imposter. Waffle sat down, still staring at the cracks in the door frame. Deep contemplation was visible on his bear shaped face. Just kidding. He's a bear. He is thinking very hard about something though. Probably waffles. Or at least, waffles are a major player in his thoughts. The flames began dying down quite rapidly as there was little left to burn. As it changed from a small inferno into a smoldering group of charred trees, things became quiet again, if only for a moment. Naturally, the flames drew the attention of things in the immediate vicinity, including several much more dangerous grimm. Six Creeps had just come running out of the nearest hole in the village wall and were charging at the group of four. Before the team could act, however, there was a brief rumble heralding the appearance of twelve more Creeps burrowing out of the ground all around them. The group was surrounded! While the approaching six were bunched up quite nicely, the remaining twelve were spread very thin in a wide circle. Smashing them all at once would be a challenge simply due to how far apart they were. Of course, the sudden appearance of the Ring o' Grimm became a footnote, when a second tremor shook the ground, many times more than the first. A near deafening guttural roar, which slowing changed into an ear-piercing screech, echoed forth as a massive creature broke through the surface of the ground. Its front leg smashed effortlessly through the crumbling wall, revealing itself in full to the party. The creature would be nearly three stories tall if standing fully on it's four massive, heavily armored legs that extended like spider legs out from his body. A single claw, if it could be called that considering its longer than any of the students, dug slightly into the ground as its front leg dug back into the ground after smashing the wall. The body had no neck, and its head rested quite close to the ground. Its back, however, expanded up and outward and formed something of a mushroom shape, the top of it being spotted. Armor protects nearly the entire body, the only weak points appearing to be the underside of the mushroom-shaped backside, and the joints of its very long legs. Knowledge Check: if you are quite knowledgeable about exceedingly rare grimm, you recognize this creature as a Sporeback. They are so extremely rare, that on average, perhaps one out of every 1000 graduate hunters ever even see one. They are known for their ability to spawn swarms of Creeps from the spots on the top of their mushroom back. Their danger level is very high due to their ability to use sheer force of numbers to overwhelm even the strongest of hunters. Their greatest weakness is that they are very, very slow. When they burrow into the ground, they leave only the top of their back exposed to the surface, granting them unbelievable defense while retaining the ability to spawn Creeps. Significant effort will be required to down the creature. It is quite likely that this thing was not supposed to be here. There was still some distance between the massive entity and the team, and the Creeps surrounding them were the immediate threat. The creature did not appear to be moving toward them. In fact, it was still partially burrowed into the ground as it faced them, peering at them with its four glowing red eyes. Kaali had followed the rest of her team to the walled village. The damage to the wall was quite severe, but the whole could serve as a nice bottleneck as long as they could get the other side under control. Stepping forward, Kaali addressed Vahn and Mae while she examined the village wall. When she discovered an easy spot to get over it. she pointed it out. "From the sounds of it, we need to help inside the wall too. We can use that hole as a bottleneck if we can clear out the ones inside. The three of us should get in there and do that. We can let Cerulean and Riot handle the incoming ones. They're both frustrating to talk to but they seem capable, despite injuries. We can get in over there. Its a long jump but the hill rises up near the wall there. The high ground will benefit your ranged weapons, too." Sheathing her weapon due to the lack of immediate danger, she began moving toward the wall and getting ready to leap across. The jump was long, but she knew she could make it. The question was whether the other two could, should they come with. As she thought, with the help of her semblance she made the jump on top of the wall easily and turned around ready to try and catch the others if they needed help. As the fireball engulfed the dense plant life, all manner of screeches and other awkward sounds could be heard. And just a moment later, a swarm of tiny, adorable squirrel grimm scattered from the area in every direction, many of them already on fire. Their glowing red eyes looked for a solution to their plight, but they saw none as they ran in a panic. The ones who escaped the flames all disappeared into holes or under other bits of foliage or cover, but the ones who didn't simply ran out of time as the flames took their energy and eventually the smoke from the fire turned to smoke from the Grimm dissipating. Squirrel lovers everywhere cried out at once as a feeling of unease washed over them. Someone, somewhere, committed an atrocity. Of course, they're just Grimm. No actual squirrels were harmed in the fireballing of that thicket. Kaali was about to reply to his request for bandages but was interrupted when Riot took off running, or something that resembled running considering his current state. Spotting the grimm heading toward the town, and watching Vahn take off after the critically injured Riot, Kaali turned and fixated on Cerulean. Her guard was fully up and her semblance was steady and active, but her blade still remained at her side instead of in front of her. "There appears to be a higher priority than slaughtering an injured human. Agreed?" Her face showed a fair bit of resolve, but it was evident that she was nervous, perhaps a little scared. She knew the person in front of her was a full-fledged huntsman. She knew that a direct fight him would be brutally hard. But she kept her straight face as best she could as she pushed the fear to the back of her mind. The Grimm were the priority. They're always the priority. As the wall came more clearly into view, it became clear just how old it was. The wall was made of stone and was easily five feet thick originally. It was heavily eroded away in the places where there wasn't just a massive hole, likely from some previous student. The wood the gate was one made of was completely gone, leaving a frame of metal that reinforced it. The metal was bent and crushed in multiple directions, making it impossible to close it even a little. Walking along the wall was possible due to its width, despite the erosion and damage. Just past the gate was a cobblestone road and the foundation for some kind of building, likely once a guardhouse, being so close to the entrance. The road itself was in horrendous shape. Rocks lay everywhere, and the holes they were once in have been filled with dirt or mud, or nothing at all. Outside the wall, there was a small thicket of trees and undergrowth to the left of the road, not 20 feet away from the outside edge of the wall. Even those paying little attention to their surroundings could see movement of something in there. Grimm? Maybe. Probably. But they did not seem keen on leaving their heavy cover. Recovering from her loss of balance after the injured man collided with her, Kaali stood up straight with her sword still in hand but resting. Her eyes focused with purpose on Cerulean, considering him the primary threat for the moment. "Nowhere in our orders does it say to kill anyone! Who are you to decide who lives and who dies?!" Her grip on her blade tightened as she took a deep breath to calm herself before looking toward the injured one as if checking to see if he'll run or do some fancy wooshy speed attack like before. Can't do red as Ruby already is. Rein is Norwegian for Rain so blue works. Reinhardt is a German red. Ruby is an English red. They're different so its okay. The front door was not designed with Waffles in mind. The frame was slightly cracked even because Waffle once believed in the power of squeezing through the door. Waffle was not a small bear. He easily stood at 10 feet tall when on his back legs, and weighed over a thousand pounds. That door was not designed to accommodate these things. Waffle knew. When "Mia" entered the store, he paused and looked at the crack in the frame while recalling the time that it happened. It was horrible. Mia was so mad that Waffle didn't get any waffles for a week. Worst week ever. And so, Waffle watched "Mia" enter the store, hopeful that she was going to get his waffles and bring them back out. Letting Cobe mull over his thoughts about the Steam crystals and Dust, Mia excused herself before greeting Anna warmly as she arrived at the wall dispensers. "Morning!" Instead of directly asking, she left it at that and turned to the other two customers that had just arrived. She greeted the pair of them at once, but her inflection changed at the end. "Morni...ing?" Strangely, she saw herself standing in the shop, looking at some display filled with basic cartridges for weapons. Must be a lack of sleep or something. Regardless, she stared at "Mia" for too long. Reinhardt can be interpreted to mean things like hardy, brave, strong. Red is often associated with strength. Most helmets don't cover the eyes. How else would you see?! Nose is valid though. "not" is not capitalized in the same way that "von" in Rick von Strudel is not capitalized.